An object of art and function: A modern version of the traditionally forged Japanese sword. It was raining. Lots of rain, tons of rain, as we made our way from Shikoku, an island south and a little west of Honshu, Japan's main island. On the long bridge that connects Shikoku to the mainland, which yesterday had offered spectacular views, we could see nothing; not one thing as the train, oblivious to the weather, glided back to the more familiar shore. The Shinkansen (super express train) took us to Gifu. Then, a familiar story when traveling outside large cities in Japan, we took a tiny commuter line to the smallish town of Shin-Gifu. At that point, we were supposed to take a city bus to Seki, but with ten people, with luggage, unfamiliar with the area, in the rain, in the dark, the 5,000 or so yen (around $49) it was estimated it might take to get us to our hotel there by taxi seemed bearable; worthwhile, even. Five thousand yen became six thousand as the small fleet of taxis we commandeered at the commuter station got lost, though even in the dark, I could see how small the town was. No matter. We finally convinced the driver to call the hotel on his cell phone. Considerably poorer, we gratefully settled into our rooms and prayed for better weather in the morning. I was in Japan in as a part of a small-group trip, and we had come to Seki from Shikoku (another story) for only one reason: to see a presentation on sword-making in this small town that had been famous for swords and cutlery for hundreds of years. By chance, we had missed the regular exhibition held from time to time at the Seki Swordsmith Museum, but some persuasion by our travel agent, along with some extra cash, procured us a private show, to be held the following morning in an outdoor forge on the museum grounds. Seki has been famous for swordmaking for many, many years. Some sources state swords from Seki date back 900 years; actual evidence of blades from Seki goes back 600 years (Kopp et al. 2002: 59). Early blades from the Muromachi Period (1392-1573) were made (in Chinese style) for export to China. It is estimated that 70% of swords made in Japan during that time were from Seki (Kopp et al. 2002: 60). As the needs of the bushi (warriors) evolved to more interest in swords, and technology advanced to provide them, Seki continued as a leading area for sword production. In the Edo Period (1603-1867), the ruling samurai class wore swords to distinguish themselves from commoners as well as for settling disputes. Blades both practical and artful were produced in great numbers. Once the wearing of swords became illegal at the start of the Meiji period (1868-1912), the swordmakers of Seki put their considerable talents to use in making excellent kitchen cutlery, a practice that endures today. However, in the early Showa Period (1926-1989), in the time leading up to the Pacific War, approximately 1/2 of the town's population (about 30,000 at the time) was involved in producing swords for the war effort - chiefly blades made to accessorize officers' uniforms (Kopp et al. 2002: 63). Unlike the blades of earlier times, made for fighting and/or display and limited to the ruling samurai class, Showa Period blades reflected both the budget and interest of the officers who purchased them. (In 19th century European style, Imperial Japanese officers wore dress-type swords, though they were distinctively Japanese in design). While some were simply and cheaply made using modern methods, other swords produced by traditional means were perhaps as good as any made for a feudal lord. It is estimated that Seki, as the major producer of Showa-to, produced 18,000 blades per month on average (about 17,000 modern-made) until the end of the war (Kopp, et al. 2002: 63). Nowadays, the reasons for swordmaking have more to do with art, than war. Individual collectors who are interested in the work of certain smiths commission swords, and they are sometimes made for practitioners of iaido and iaijutsu who can afford them. (Sharpened, non-traditional swords are illegal in Japan. As Kopp, et al. 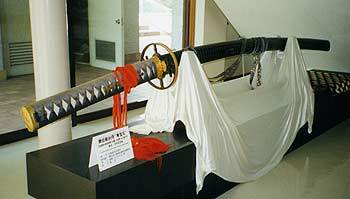 (2002) point out, unpapered Showa-to (that is, swords not made by recognized smiths during that time) are also illegal in Japan today. The ones that survived the Pacific War are held by collectors and some iai practitioners outside Japan (Kopp et al. 2002: 63)). Now, Japanese swords are made only by traditional methods, and smiths are licensed and registered. Individual quotas are set according to the rank of the swordsmith to limit the number of artisanal swords made per year. Depending on the rank of the sword maker, it is a part-time job for most. Readers who saw the recent PBS series on Nova, "Secrets of the Samurai Sword" (2007) know that a number of people are involved in the production of a traditional katana. Each group of workers performs an essential function. The process begins with workers refining the iron-rich sand into tamahagane,, chunks of iron ore, by firing it in large furnaces. After taking delivery of the refined ore, the smith then sorts it - that containing less carbon is used for the body of the sword; the harder, more carbon-rich ore is retained for forging the edge. A display table at the Seki Swordsmith Museum shows the stages of iron in the making of a sword, from tamahagane (r) to finished blade (l). Photo two shows part of the actual forging process used in the making of a blade. Apprentices are essential to performing the grunt work of a sword forge - shoveling coal, preparing the fire, taking turns beating the hot metal according to the smith's instructions. The smith and his apprentices fold, refold, lengthen, shape and temper the sword. An assistant pounds the metal according to the smith's instructions during the swordmaking demonstration at the Seki Swordsmith Museum. After the blade has been made to the smith's satisfaction, it must go to the polisher, who brings out the beauty of the hamon (decorative edge), gives the blade its sharpness and defines the kissaki (tip), the shinogi (ridgeline) and other features of the blade. Polishing also helps protect the blade from rust. At this point, the finished blade goes to a woodworker for a shirasaya - a plain, unadorned wooden sheath and handle that protects the sword until the fittings, made by yet several other artisans, can be made. The shirasaya maker also makes the traditional lacquered saya (sheath) for a fitted-out blade. Depending on the type of blade, its purpose for being and the rank of the smith, a traditionally-made, low end blade can cost as much as $5000 (with fittings, $7000) and the prices are continually going up. Considering the number of people involved in the production of a single sword, the price should come as no surprise. Needless to say, blades by high-ranking swordmakers sell at fine-art prices. It should be noted there are enough old, properly registered blades in Japan that serious iaidoka are able to purchase them for much less for use in practicing kata or cutting makiwara (straw targets). That said, it is a particular thrill to have a blade made specifically for an individual practitioner, provided the individual can afford it. The following day in Seki was crystal clear, with the humidity miraculously low. Since it was this time a short taxi-hop to the Seki Swordsmith Museum, we climbed aboard again (sans luggage) and arrived in less than 1000 yen (which is to say, about ten minutes). The outdoor forge was a roofed area similar to a picnic shelter, arranged like a small amphitheatre. The forge itself was surrounded by a barrier fence, but was open to benches at the opposite side that could seat 30 or 40 people. Even though a traditional shrine for the god of the forge was evident behind the furnace, the area was definitely more exhibition space than workshop. The ten of us took our seats (with a couple of curious museum-goers nearby) for the presentation. the swordmaker at work in the exhibition space. The resident swordmaker, Kojima san, introduced himself. It is the practice among professional swordmakers, like a lot of traditional Japanese artists, to work under a professional name that is unlike his given name. Kojima san's professional name is Kanemachi. Kojima san and his assistants were dressed in the traditional white workman's clothes, though some of the details on Kojima san's kimono and hakama set him off as the master of the forge, distinct from the other three young men. Kojima san gave a short presentation on swordmaking. He showed us some examples of tamahagane, and explained its origin. He showed pieces of iron and steel in the various stages of being folded and shaped into the familiar katana shape. He explained that his quota was limited to about two swords a year (which suggested his ranking was not very high). That day, Kojima san said that he and his three assistants would be heating, bending and rebending an iron block which, with some luck and a lot of hard work, would be destined to become a sword at some point in the future. Kojima san shows the layers in a block of iron ore.
Kojima san explains the process of shaping the ore into a blade. After taking the time to answer a few questions, Kojima san and his assistants got to work. From the audience, the furnace was happily some distance away, but we were welcome to come closer provided we stayed behind the barriers on either side of the forge. The smith faced the hot fire in the small furnace and worked the bellows, making the flames shoot up. Kojima san pulled the hunk of iron out of the fire (where it had been heating since before he started his talk). He then pounded the red-hot metal, turning it this way and that. From time to time, he would move it to an anvil off to the side and signal with taps of his hammer for the assistants to take turns beating the iron rectangle. The smith and an assistant stoke the fire. Note the bellows the smith is operating with his left hand. Every movement, from turning to pounding to fanning the flames, sent sparks and tongues of fire flicking up towards the ceiling. The smith's signal taps and his assistants' response became a steady, syncopated rhythm. Eventually, the fading red color indicated the iron bar was cooling, at which point it would be thrust back into the fire to be heated again. The sound of the bellows as the iron was reheated then took over, rhythm almost somnambulant in its regularity. Once the piece got to be a certain length, Kojima san pounded a groove into it crossways and folded it in two. The piece was then returned to the flames and the pattern of heating and hammering began again. The three assistants pound the red-hot metal in turn. The movements were simple and repetitive, yet the process was complex. Kojima san closely observed everything, from the color of the hot iron to the angle and intensity of the hammers of the assistants as they pounded in rhythm, to the colors in the fire itself. Over the 1/2 hour or so it took to perform the demonstration, I had a chance to observe the physical ease with which the smith conducted himself, in spite of what must have been considerable heat and a certain amount of danger. His skin was marked by tiny burn marks, acquired over long years of experience. Many hours of skilled labor were reflected in his relaxed and efficient efforts. At the end of the time, the rhythm was disrupted; the assistants began to clean up and shut down the forge. We thanked Kojima san for his time with us, and went to explore the museum. The museum was not very large, and nearly empty on a weekday. The solitude was a real counterpoint to the roar of flames and pinging of hammers we had just experienced outside. There were some exhibits of swordmaking processes, metallurgy and cutlery making. A very, very long sword (over two meters long), an example of the art of the swordmakers of Seki, was the high point for most of the members of the group. Seki-Photo-1.jpg here (again) nesxt to the following paragraph(s). Caption: The very long sword on display, a tribute to the skill of the swordmakers of Seki. By the time we finished with the museum, the sun was well advanced and the day was getting very hot and very bright. We wandered around downtown but Wednesday seemed to be a day off for many merchants and most of the stores (selling mostly cutlery) were closed. We returned to our hotel, collected our luggage and prepared to move on to our next stop. Currently, the US market is flooded with Chinese-made sharpened steel blades that are made to resemble Japanese katana. They are easily obtainable and inexpensive, and can be useful for cutting rolled straw targets and the like, but their similarity to actual katana is like that of a diamond to a zircon. On the surface, to the untrained eye, a Chinese "sharpie" seems like a bargain, and it is. The one thing it is not, however, is a katana. No matter what anyone may say, unless someone is trained and licensed as a smith in Japan (and there are a few foreigners who have earned this distinction), they cannot claim to make a real Nihon-to. While the individual may think he is interviewing the smith, the smith assured me that he is actually assessing the potential client. He told me he could tell if someone knew anything about swords by watching the person react to some. A "This is fine, I'll take this one" attitude is strong indication that the person knows nothing, and the smith is not likely to find the time to make something for him. This particular gentleman also has no interest in making fine art swords; his feeling is that a sword must be useful and be used. Other smiths may only be interested in having their art shown off but not touched. During the meeting, part of the objective is to determine if the client and the swordmaker have similar tastes. If they do not, the swordmaker is likely to refer the client elsewhere, to someone who can better fit his needs. Only after this important negotiation does the swordmaker actually get down to business (Nakagawa 2006: n.p.). The visit to Seki not only acquainted me with an age-old tradition; it underlined the idea that real swordmaking does not take place in a museum (even though that may be the reality for most people). Like any other art, swordmaking is as individual as the people involved, and the katana that are the result are always beautiful, and often useful, living works of art. Editor’s Note: Text and Photos Copyright 2008 by Deborah Klens-Bigman & FightingArts.com. Photos by D. Klens-Bigman. Kapp, L., Kapp, H. and Yoshihara, Y. 2002: Modern Japanese Swords and Swordsmiths. NY: Kodansha Int'l. 2006: Personal communication with the author.